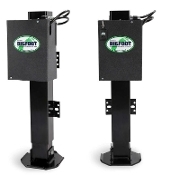 Dual Point, Single Pump 12,000 lb Square Leg Jacks that can be used on any Horse, Cargo, Heavy Equipment, or Open Trailer. Bumper Pull or Gooseneck. The 35" overall length in the retracted position has 24" of travel.